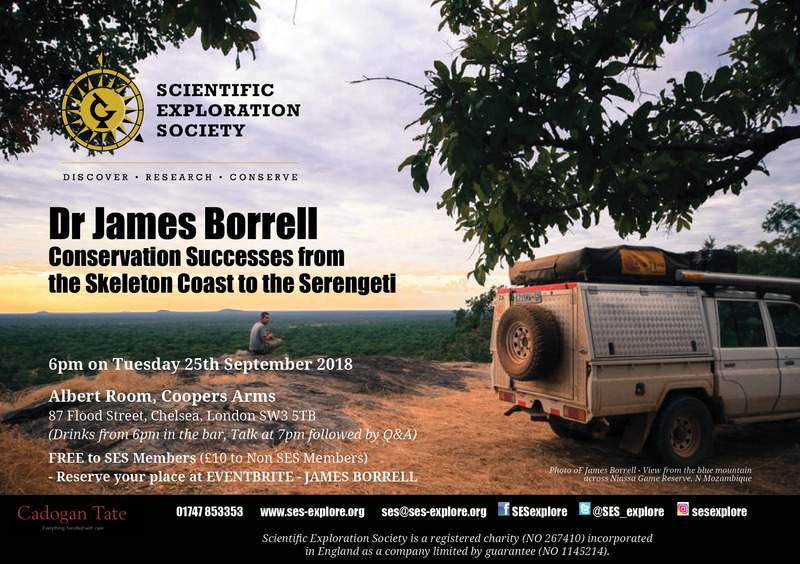 The SES is delighted to announce that SES Member, SES Explorer Award Winner and SES Trustee Dr James Borrell will be the speaker at September's Explorer Talk and will give a talk about Conservation Successes from the Skeleton Coast to the Serengeti on Tuesday 25th September 2018 at the Coopers Arms, Chelsea. When James Borrell was awarded the SES Cadogan Tate Explorer Award back in 2015, the Society hoped - as with all Explorer Award winners - that they had helped a true 'Pioneer with Purpose' on their first steps to a successful career in their chosen field. What James has achieved has far exceeded those hopes; swiftly off the back of a successful expedition to Madagascar, he spent the first half of 2017 travelling 32,000kms across nine African countries in search of conservation success stories. Join us to hear those stories, and be inspired by his unfaltering optimism for conservation and the pioneering people and communities who share his passion to succeed. DATE & TIME: Tuesday 25th September 2018 - Drinks in the bar from 6pm; Talk in the Albert Room at 7pm (followed by Q&A); More Drinks in the bar afterwards, if wanted!